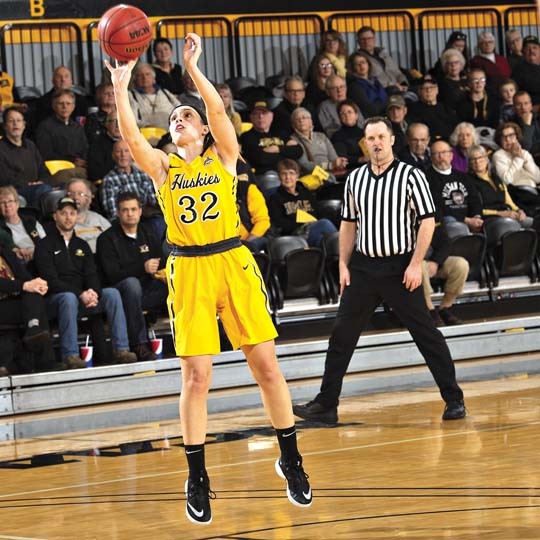 David Archambeau/Daily Mining Gazette Michigan Tech’s Ellie Welsh attempts a jump shot during a game against Northern Michigan last Thursday in the Wood Gym. HOUGHTON — Michigan Tech Huskies women’s basketball coach Sam Hoyt hopes Tuesday night’s quarterfinal game of the GLIAC Tournament against the Northwood Timberwolves will be, at the very least, a repeat of her team’s 60-55 win over the Northern Michigan Wildcats (NMU) last Thursday both on the court and in the stands of the Wood Gym. The Huskies (20-8 overall, 16-4 GLIAC) enter the tournament as the No. 3 seed. They have beaten the No. 3 seed Northwood (13-15 overall, 10-10 GLIAC) twice already this season. In December, they downed the Timberwolves on the road, 78-68. In February, they beat them at home, 70-40. Even with those two victories, Hoyt is not taking Tuesday’s contest lightly. She is quite familiar with the sport axiom that it is hard to beat any team three times in one year. Hoyt should know. She was an assistant coach at Northwood during the 2014-15 season. The Timberwolves are led by Ellie Taylor who averages 13 points per game and is followed by Grace German who scores 11 points per game on average. As a team, the Timberwolves average 63.3 points per game. 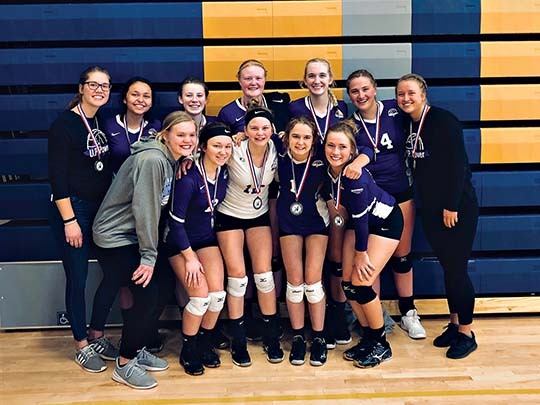 Hoyt added that she is very pleased with her team’s chemistry, and it has proved to be a winning combination. With that unselfish style of play, the Huskies have routinely had four or five players scoring in double figures on any given night. “That make us harder to guard and gives each of our players a sense of confidence in themselves and helps their teammates,” she said. The Huskies enter Tuesday’s game shooting 43.6 percent from the field which is the third-best in GLIAC. Junior Abbie Botz leads the team in scoring with 11.2 points per game and 8.2 rebounds. Senior Elizabeth Kelliher follows her with 10.1 points per game and 5.2 rebounds. Hoyt noted that, as a senior, Kelliher has proved herself as more than just a scorer. Execution, energy and playing focused are what Hoyt sees as the keys to an Tech win. With a win, the Huskies will advance to the GLIAC semifinals for a chance to play in the finals, both of which will be hosted by the highest remaining seed on Saturday and Sunday. Tuesday’s tip-off will be at 5:30 p.m. at the Wood Gym.